These Basicgrey papers lend themselves perfectly to this Provencal stamp set from Stampin’ Up (thank you Amy Davis for these garage sale finds)! An elegant design seems to come so naturally to the creation of this card. It makes an ideal masculine card and also an elegant card for simply anyone. What a perfect combination for World Card Making Day! I’ve stepped out of my usual “cute” cards to more of a unique blend of elegance and timeless designs. 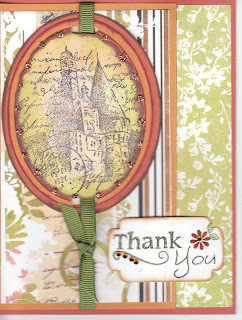 It seems I just can’t quit making cards ……………… so little time; so many more cards to make!! Yeah! !